In the central highlands of Afghanistan, in any house you enter, the floor is covered with local Namad, a kind of a carpet, which is made from sheep wool. Namad is perhaps the most suitable floor covering considering the harsh climate and rural lifestyle of small land farms and livestock.Despite the import of industrial made carpets, Namad is still the most favored floor covering in rural central Afghanistan, especially, in Bamiyan and Daikundi. In the past, it was only used for covering the floor. Today, locals make a variety of objects, including laptop bags, waistcoats and shoes with the hope to attract tourists visiting Bamiyan and to find a broader market. 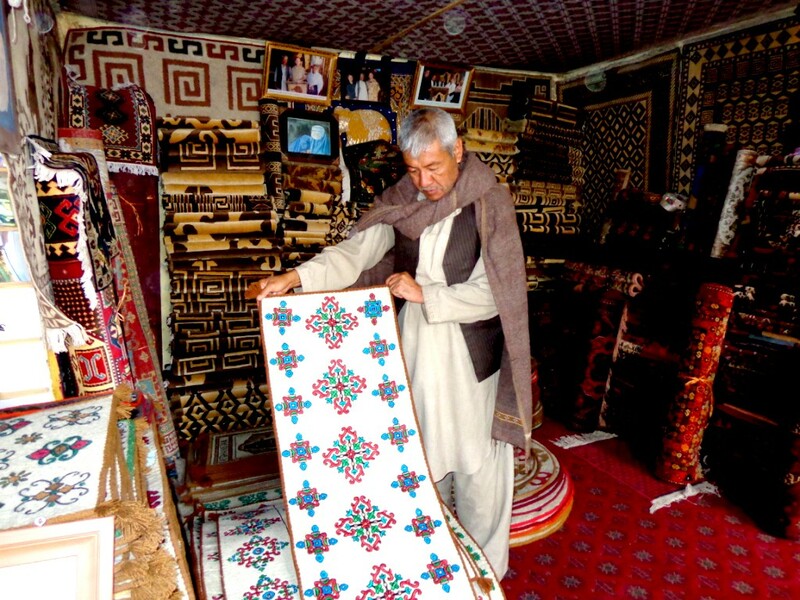 Ghulam Ali, a local businessman of handicrafts, says that in the past he was only looking for outside markets to sell Bamiyan carpets. But today, Namad has found its own way through markets.next to the carpets. He adds that this not only promotes the Province’s handicrafts but also provides in income to many poor families whose female members, who have no access to any other source of income. Local traders are hoping for governmental and international support for marketing their goods as well as for their indigenous industries. 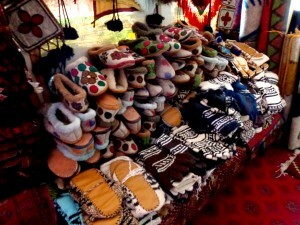 The reason local Namad makers have diversified their products is, that they see internationals as their first customers. They mostly do not buy it to cover the floor, rather they use it for design purposes and thus the Namad pieces are designed in much smaller shapes to be used on couches, chairs or tables or just to be hanged on the wall. Namad is mostly made in two colors: black and faded white. Black Namad generally has better market chances than other colors. However, the black Namad, which is made of the wool of young sheep (wool cut for the first time from young sheep) is the most favorable one, especially for the older people, who are suffering from rheumatism. In many valleys of the central highlands of Afghanistan, women mostly do handicrafts and make their own Namad whether for sale or for their own use. The most famous Namad are made in Legaan, Waras district of Bamiyan. Ameena, a woman from Daikundi, who used to make Namad , explains that after collecting the wool from the sheep, the wool is categorized based on its quality. The wool of the younger and fatter sheep, which is longer and softer, is chosen for making Namad. First the wool is washed to be clean and soft enough. Then the already washed wool is hit with thin sticks to separate glued wools from each other. After this the wool is appropriately spread on a level ground on a mat in the size the Namad is supposed to be made; surely a little bigger because it would shrink gradually. Then special plants collected from mountains would be boiled in water and applied on the wool. It is slowly rolled and rubbed by a group of women till the wool completely holds together. Water is applied repeatedly when necessary. A Namad is usually rubbed three times, an activity where women in the villages voluntarily help each other. Namad rubbing is a very strong symbol of the collective spirit in rural Afghanistan; it creates bonds between the villagers.